Through acts of service repairing homes and community centers in rural and urban communities, SSP invites youth and young adults into a closer relationship with God and to experience the transformative power of serving people who have a culture and life experience different from their own. We know God to be a giver of wonderful gifts. 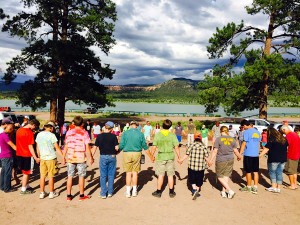 Sierra Service Project is an extension of the Divine Invitation into a relationship with God. Like God, Sierra Service Project can only invite but cannot control the response of those invited. Like grace, Sierra Service Project offers service freely without judging if the receiver merits our love. As participants of Sierra Service Project, we are the receivers of God’s grace. We extend that same grace to our hosts by putting our faith into action repairing and building homes. Like grace, Sierra Service Project offers service freely without judging if the receiver merits our love. We respond to God’s invitation to open ourselves up to the possibility of a transformational experience. In community, we begin to recognize our dependence on God and inter-dependence with each other. As a community, we strive to grow being led by the Spirit. We choose to serve believing, that through our humble acts of love, we can learn about God’s character and love for us. We seek to accept people, as they are from the moment they stand before us, as the first step toward relationship. We seek to remain open; an openness of hand and of heart that we might give, receive and understand. In community, we begin to recognize our dependence on God and inter-dependence with each other. Through our acts of service, we allow the grace of God to flow into and through our lives. We understand that all people are valuable, carefully fashioned in God’s image and we are freed to accept the essential humanity of each person we meet. In reaching out to others, we follow the example of service set forth by Jesus Christ. We understand that all people are valuable, carefully fashioned in God’s image. As with Christ, we serve people whose lives will benefit by our service. We believe that God lives with us and the work we do with our hands and heart. We realize, that despite the differences in culture, values, history and geography, we are all brothers and sisters of worth. Let us accept the Sierra Service Project invitation. Let us rise up and build. We are all brothers and sisters of worth. For it is by grace you have been saved, through faith – and this not from yourselves, it is the gift of God – not by works, so that no one can boast. The Lord has showed you what is good. And what does the Lord require of you? To act justly and to love mercy and to walk humbly with your God. …you are no longer foreigners and aliens, but fellow citizens with God’s people and members of God’s household, built on the foundation of the apostles and prophets, with Christ Jesus himself as the chief cornerstone. In him the whole building is joined together and rises to become a holy temple in the Lord. And in him you too are being built together to become a dwelling in which God lives by his Spirit.